An official statement from the Justice Minister came after inquiries made by the Garda Commissioner to local garda management. NO REPORT WAS made on the Justice Minister Alan Shatter being stopped and breathalysed by gardaí, the minister said today. The matter came to light last week, when Deputy Mattie McGrath broached the topic on Thursday morning in the Dáil. 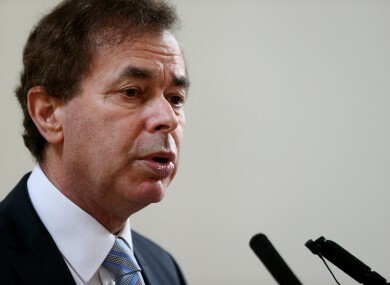 At the time, the Minister for Justice, Equality and Defence, Alan Shatter TD said the incident happened in late 2008 or 2009, at Pembroke Street in Dublin. McGrath had asked during Leaders’ Questions if the Taoiseach or Tánaiste were aware of an incident where Shatter was stopped and breathalysed by gardaí. Speaking today, Minister Shatter said that following on from the issue raised in the Dáil last week, the Secretary General of the Department of Justice and Equality asked the Garda Commissioner to ascertain whether there was a garda report on the matter. The Commissioner has confirmed that he caused inquiries to be made by local Garda management as to whether or not a report of the incident was made at the time. He is informed that no such report was generated by the Garda member involved and a further local search of the garda computer system has failed to locate any such report. However, today’s Irish Independent carries a report on the matter, which says that a garda report made on the incident is “missing”. Shatter had been stopped at a mandatory checkpoint and said last week that he failed to fully complete the breathalyser test due to being asthmatic. He said he had explained this to the garda and was waved on, and that there “was no question of my having consumed any alcohol, nor of my having committed any offence under the Road Traffic Acts”. A motion of no confidence in Shatter will be brought before the Dáil this evening by Fianna Fáil. The motion was tabled on Friday and will be debated today and tomorrow, with a final vote on Wednesday evening. Fianna Fáil’s justice spokesman Niall Collins said Shatter’s position had become untenable following his disclosure of a Garda incident involving Deputy Mick Wallace. Speaking to Morning Ireland on RTÉ radio this morning, the Tánaiste Eamon Gilmore said that he believes Fianna Fáil are “dragging the bottom of the barrel to have an issue to have a private members motion on”. He said that there are “a lot more important issues in the country that need discussion in the Dáil than whether Alan Shatter was stopped at a checkpoint or not”. Niall Collins told Morning Ireland that Gilmore is “missing the point” and that the party has “reached a tipping point with this minister”. He said that Shatter’s judgement “has been severely called into question” and that he believed he his unfit to hold the office of Minister for Justice. He also said the working relationship that should exist between the Minister for Justice of the day and the Garda Commissioner should be questioned, given that Shatter mentioned Deputy Mick Wallace’s encounter with gardaí on Prime Time. Email “Shatter: 'No garda report generated on breathalyser incident' ”. Feedback on “Shatter: 'No garda report generated on breathalyser incident' ”.